"Autumn in New York is World Series time." You can run down the Yankees for all sorts of reasons�for arrogance, for buying their team, for rubbing other team's noses in it�but you'd still have to admit that that's quite a flag collection they've got up there in the Bronx, with 26 World Series championships, and counting. (At least, according to the rabid Yankees fans with whom I live.) This box set is only for the pinstripe faithful, for it's likely to turn your stomach otherwise; it's the case for a salary cap in five DVDs. What's kind of fun to see is the evolution of the highlight film�things don't go all the back to the days of the Highlanders, or even to the legendary 1927 team, but begins in a peculiar place, actually, with the 1943 World Series, with most of the better known players off fighting in the Second World War. Still, Bill Dickey is enough to lead Joe McCarthy's Yankees past the Cardinals, and as the first batch of these are, this one is directed and narrated by Lew Fonseca. Next is the beginning of a continuing series of Brooklyn Dodger losses to the Yankees, first in 1947, when not even barrier-shattering rookie Jackie Robinson can bring glory to Ebbets Field; this one also includes clips from that year's All Star Game. The Yankees stick it to the Dodgers again in 1949, with Ty Cobb and Happy Chandler in the stands as the game's elder statesmen, and the disc finishes with 1950, when Whitey Ford led the Yanks over the Phillies. It's a particular kick to see all the gentlemen in the stands in coats and ties. You know, just like today. 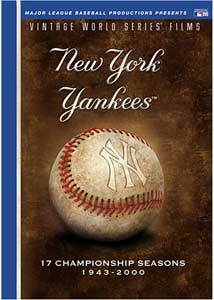 Disc 2 is confined to the five boroughs�first the New York Giants are victimized in 1951, a chance to see Joe Di Maggio, Mickey Mantle and Willie Mays on the field at the same time. Then it's Brooklyn (1952), Brooklyn (1953) and still more Brooklyn (1956)�Fonseca doesn't let anyone else get in a word, not even Don Larsen in '56 after his perfect game, though there are of course a few instances of Yogi Berra jumping into Larsen's arms, like a baby on Christmas morning. The editing on all of these is a little choppy, with lots and lots of inserts obviously shot later; and there are odd editorial choices, such as focusing in '56 not on Larsen, but on the umpire who called the game. It's also a nice opportunity to revisit the earnest billboards of yesteryear, with their promise of shirts that "won't wrinkle�.ever!" Disc 3 leads off with the 1958 highlight reel, the first one here shot in color, showing us the Yankees coming back from 3-1 down against the Milwaukee Braves. Mel Allen takes over from Fonseca in 1961, the legendary year of Maris and Mantle, with Ralph Houk leading the team over Cincinnati; the next year the Giants are the victims, with all the obligatory shots of the Golden Gate Bridge. And 1977 can be summed up in a single world: Reg-GIE! Disc 4 kicks off with more of the same, from 1978, and personally I cannot ever get enough of Tommy Lasorda blowing a gasket and losing, particularly apoplectic about a throw from second that deflected off of the right hip of Reginald�Martinez�Jackson. (Please provide your own Cosell imitation.) Diehard Yankee dOc fans will recognize the rest of the content from this set, for we've leapt ahead to the Joe Torre era�the Braves blow a two-game lead in 1996, and with 125 wins and a sweep of the Padres, the Yankees dub themselves the Team of the Century in 1998. You sense the Yankees getting caught up in their own grandeur here, too, for the previous highlight films ran 30 minutes or so; the 1996 piece alone is over an hour and a quarter. And finally Disc 5, where it's all about the pedigree, first with the Braves in 1999, and then, most painfully for your faithful correspondent, the return of the Subway Series and the victory over the Mets in 2000. It has now been six long years since the Yankees have won a World Series, and this pernicious curse grows more diabolical every day. Image Transfer Review: Source material evolves from the raggedy to the pristine, and it's all reasonably well transferred. Audio Transfer Review: Lots of hiss and crackle as we come out of the 1940s, but John Sterling and Frank Sinatra sound just fine in the 1990s. Extras Review: No bells and whistles, just men playing the great American pastime. There's no denying the Yankees their illustrious baseball pedigree, and this box set provides the diehards in Yankee Nation with the chance to crow all over again. DVDs for a rabid and self-selecting audience.